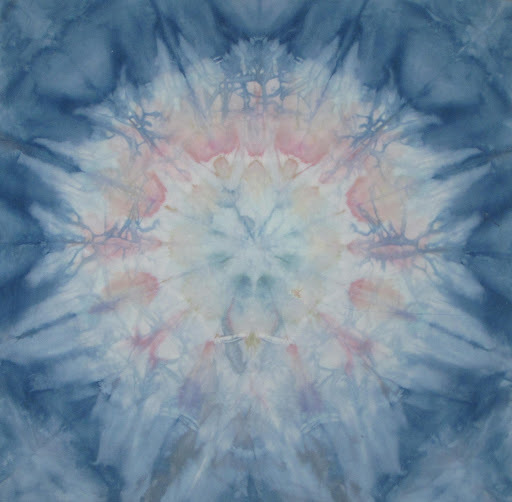 When I was first learning about fabric dyeing, I read about many different techniques. One that I tried and really enjoyed was a technique known as snow dyeing. And, living in Minnesota, we certainly have plenty of snow each year to play with! After trying some small samples, my first major piece that I dyed was the backing to my dyed fabric quilt (see Sept 22, 2015 post for more information). 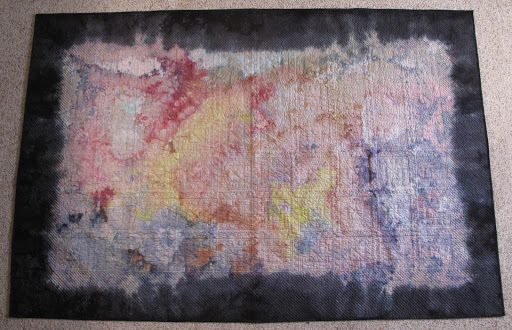 I wanted the back of the quilt to complement the pieced from quilt, so I snow dyed with my six main dyes. I then folded the fabric in a manner that brought all of the borders together and over-dyed the edges with black dye. The result was very nice and looks much better in person than in this photo. 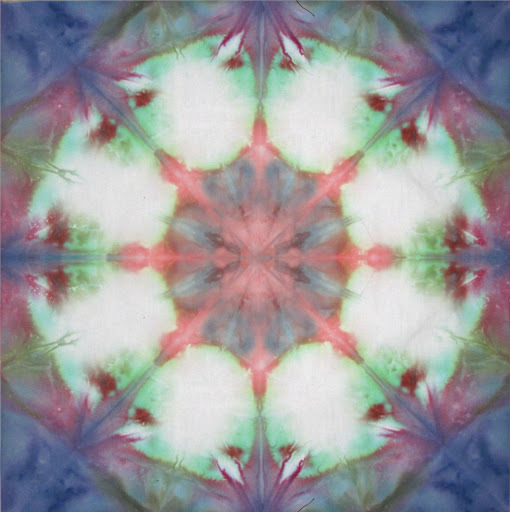 Now that there is a fair amount of snow outside, I decided to take my snow dyeing one step farther – Mandalas. Looking around any craft store or art supply store, you will see adult coloring books. 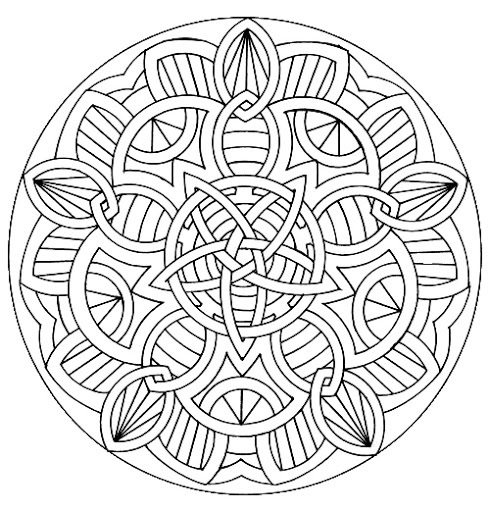 Many of these have mandalas for coloring. The word “mandala” is from the classical Indian language of Sanskrit. Loosely translated to mean “circle”. However, a mandala is far from the simple shape we think of as a circle. It is a complex structure with overlapping lines of shape and color. Unable to find specific instructions for snow dyeing mandalas, I decided that some experimentation would be necessary. Combed cotton fabric 22″ x 22″, soaked in warmed soda ash solution for 30 minutes. 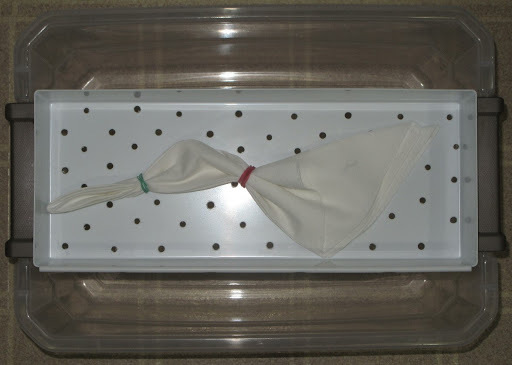 Remove the fabric from the solution and squeeze the excess liquid from the fabric. Hang to dry for 24 hours. Iron the folds into the fabric. 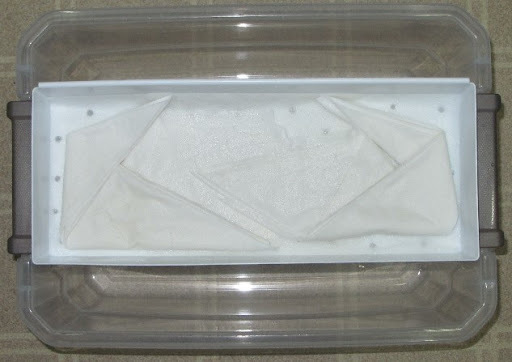 Place folded fabric in drain tray. I used a drawer organizer with holes drilled in the bottom. The organizer was then set above a large storage bucket to collect the melting snow. Cover the fabric with snow. Make sure that there is no fabric visible. I used about 8 cups of snow. Sprinkle a total of 1/2 teaspoon of Procian MX dye over the snow. I used several colors hoping for some colors blending together. Fabric covered with snow and sprinkled with dye powder. I forgot to take a photo right away. The above photo was taken after three hours. You can see that the snow had melted and the dye powder had blended a bit. Place the lid over the bucket (mostly to keep the cat out of the dyes) and allow to sit at room temperature for 24 hours. too much white, I need to add more dye. So, I checked for any suggestions on-line. One site stated that the colors were more vibrant if the dye was mixed directly with the snow. I will give that a try. And, to save time, I realized that snow melting over fabric will make the fabric wet (I certainly didn’t need Sherlock to help me make that deduction). So, next sample I will use the fabric immediately after soaking in the soda ash solution. I also wanted to see what happened if I used preprinted fabric. I was hoping that this might be a nice way to make my own fabric, but still have a pattern printed on it. So, another experiment to try. 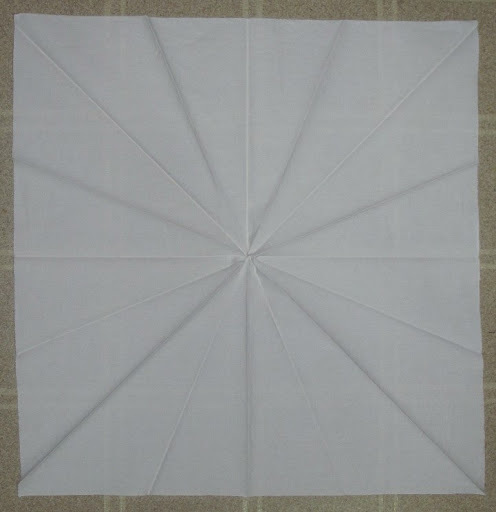 Printed white-on-white cotton fabric 18″ x 22″, soaked in warmed soda ash solution for 30 minutes. Mix dye with snow. I used Mixing Blue, Golden Yellow, Mixing Red. 1/4 teaspoon was mixed with 8 cups of snow and packed over the fabric. I did take a picture of the fabric before dyeing. Unfortunately white on white does not show very well. So, I’m not posting that picture. But, this is the dyed result. 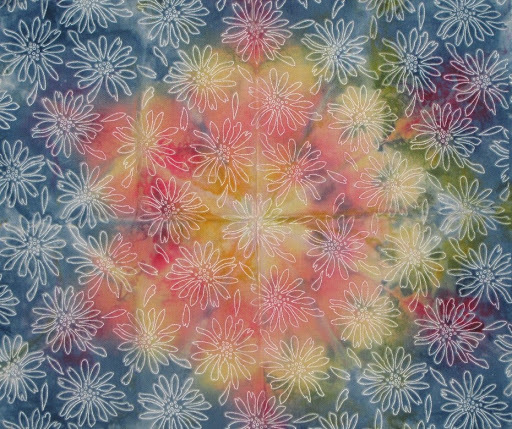 printed fabric looks nice, but maybe not for mandalas since it tends to distract from the pattern created by the dyes. Looking at more on-line ideas, I found a site that used rubber bands to bind the fabric to create more detail in the mandala. And, another site that used the microwave the speed up the dyeing process. So, more experiments to try. Combed cotton fabric 22″ x 22″ folded and bound with rubber bands. 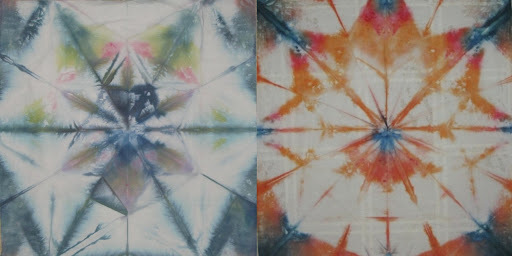 Mix dye with snow and packed over the fabric. After the snow had melted, approximately 6 hours, place the fabric in a plastic bag. Microwave on High for 30 seconds, wait 2 minutes. Repeat 4 times. Rubber bands left uneven marks on the fabric. I liked the folding better. Microwaving the dyes caused the colors to be more muted. I do love this technique, but I still need to perfect my “formulas”.